When it comes to iOS device management, Apple highly recommends the use of iTunes. Aside from restoring and updating iOS, you can also use iTunes for your entertainment needs like download and sync various contents such as music, videos, photos, TV shows, and more. Syncing your device with iTunes will result to the contents on your iOS device matching the contents in your iTunes library on your computer. One important thing you need to consider before syncing contents with iTunes is to consider using iCloud or pertinent services to keep your contents automatically updated on all your devices. It’s one way of creating backups for safekeeping. While iTunes do offer a number of good stuff, not everyone has positive experience with the platform. In fact, you can see various problems and errors reported by those who have used iTunes but to no avail. Among these errors are concerning on syncing music or audio contents in iTunes. This post is aimed to address a pertinent issue transpiring on the new iPhone 7 Plus, in which the user can’t sync music files from iTunes on the computer to the iPhone. If you need help in dealing with the same problem, then feel free to refer to some workarounds and potential solutions highlighted below this page. Many people will use iTunes to download and sync music to their iOS device. While others were able to carry out these things without any flaws, others were prompted with an alert message saying that their device cannot be synced or iTunes cannot copy a specific song. These messages are usually accompanied with pertinent error codes like error -5000, error -69, error 13010 and error 13014. If you happen to see any of these error codes, then it denotes that something went wrong and iTunes couldn’t initialize or complete the syncing process. Read and review the error message because it also entails some hint on what went wrong and what needs to get done so as to resolve the underlying cause. What causes these iTunes errors to occur on your iPhone 7 Plus? As explicated on Apple’s support page, errors in syncing music files with iTunes as mentioned above are usually triggered by some software, particularly third-party security software installed on the computer. What happens is that the software might have interfered or prevented the iPhone to access iTunes or the computer system for security reasons. This is usually the case when an antivirus or firewall is installed and enabled on the computer. The software might have seen some threats by the time your iPhone is attached. In order to carry out its main task which is to keep all sorts of security threats at bay, it has denied access to your iPhone. In other cases, the same error codes were tied to an outdated version of iTunes or the device software needs to be updated. Meanwhile, there are certain files that just can’t sync like mail accounts, notes or bookmarks. To manage these files across your devices, you can use iCloud instead. Alternatively in some iOS apps, the iTunes File Sharing feature is used to transfer contents instead of syncing. Be sure to verify and ensure that the files you are having trouble syncing with are not any of the ones mentioned. It is also possible that syncing through iTunes might be disabled, if you use iCloud or other services to keep your contents up to date. That’s another thing you need to consider checking. How to deal with iTunes syncing errors on your iPhone 7 Plus? Considering the nature of these errors are on the software layer, anyone who encounters any of the aforesaid error codes and messages can still do something to fix the problem on their end. Below is a rundown of applicable solutions and recommended workarounds to deal with syncing problems in iTunes. Make sure that you are using the latest version of iTunes on your computer. Otherwise, consider updating iTunes to the latest version available. First Solution: Sync your contents with iTunes manually and properly. Connect your iPhone 7 Plus to your computer using the supplied USB cable. Once the computer detects your iPhone, your device will show as an icon on the upper-left corner of the iTunes screen. If you don’t see this icon, disconnect your iPhone from the computer, restart your computer, and then reconnect your iPhone. Also make sure that your iPhone is turned on. Click on the device icon [iPhone 7 icon]. Navigate to Settings on the left side of the iTunes screen to view a list of the content types you can sync from your iTunes library to your iPhone 7 Plus. Click the content or file type you want to sync. Navigate to iTunes main screen then click the box next to Sync. Doing so will turn on syncing for the selected content or file type. If you see a check in the box, then it means that syncing is already enabled for that content. If after clicking the box you are prompted with a message saying that your iPhone 7 Plus is synced with another iTunes library, it means that your iPhone was previously connected to another computer. Click Erase and Sync in that message to replace all contents of the selected type on your iPhone with contents from your computer. Please note that you can only sync your iOS device with one iTunes library at a time. After enabling syncing for a content type, you will see more options you can use to customize your sync settings. You can use these options to ensure that you’re syncing the correct contents. Once you’re done selecting all content types that you want to sync click the Apply button located on the lower-right corner of the screen. Doing so will save your sync settings. If syncing does not start automatically, click the Sync button. After you turn on syncing, your contents should sync each time you connect your iPhone to your computer and open iTunes. Make sure that your computer is authorized for the contents that you are trying to sync because if not, you will be prompted with a message saying that some of your contents couldn’t sync. You need to authorize your computer (Mac or Windows) to grant permission to access apps, audiobooks, books, music, movies, and other contents. A maximum of five computers can be authorized. This means that you can play your contents on five different computers. You can authorize a computer only through iTunes on that particular computer. [Complete details on how to authorize your computer in iTunes will be provided in a separate guide]. Second Solution: Consolidate media files in your iTunes library. The same problem may also arise if the media files in your iTunes library are stored in several locations. To rule this out from the possible cause, be sure to consolidate your files and store them in one location. Doing so will correct permissions and simplify the syncing process. iTunes library files should be in your iTunes folder. The directory or file path varies depending on the computer you are using. For Mac, navigate to Go-> Home-> Music-> iTunes. For Windows 7 or later versions, go to C:\Users\username\MyMusic\iTunes\. Windows Vista and XP are no longer supported by iTunes 12.2 or later. Third Solution: Check or change your security software setup. 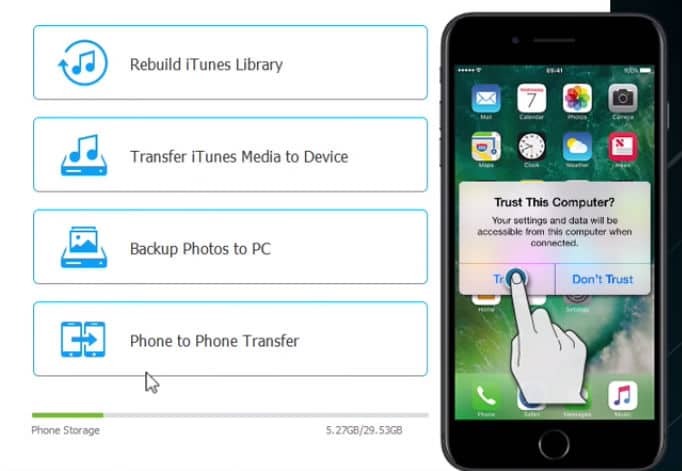 Again, third-party software including antivirus, firewall, and other security suites can prevent or interfere with the sync process between your computer and your iOS device. If you suspect that this triggers the iTunes error when syncing music on your iPhone 7 Plus, verify and configure your security software setup and then try to sync again. If you are not sure of which settings to work on or what options to change, then you can disable the security software temporarily and try to sync without it activated on the computer. Fourth Solution: Sync only a few songs or one music file at a time. If none of these is able to rectify the glitch and that you are still getting the same error while trying to sync music contents in iTunes, try to identify the songs or music file you are having trouble syncing with. It’s also possible that there might be an issue with the specific songs or the problem is isolated to certain music files that you’re trying to sync. Try to sync one song at a time then add more until the issue occurs again. Doing so will help you determine which songs or music files trigger the error to show up. Alternatively, you can download the songs directly to your iPhone 7 Plus. In iTunes, select the file or content that has the exclamation point next to it. Navigate to the menu bar at the top of your computer screen or at the top of iTunes screen, click Edit -> Get Info. Click Locate if prompted to locate the file. Navigate or specify the location where the file is stored. If you don’t know the file’s location search for it using the Search functions of your computer and then enter the name of the file to search. If the file is stored on an external device or network drive connect your device to the external drive. Once you have recovered the file, use Get Info again to locate the file then point iTunes to the correct location. If the iTunes error persists and you’ve ran out of other options, escalate the problem to your device carrier or Apple Support for further assistance and recommendations.